Headlamp rim for Trabant 500,600, 601 und 1,1. Mountable for R2 (Bilux) and H4 headlights. LED Headlight as an complete unit. Best replacement for the H4 or R2 headlights. Brilliant light quality !!! Fit to Trabant, Trabant 1.1, Baraks B1000, Barkas B1000-1, W50, Multicar, MZ motorbikes. 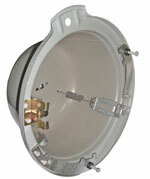 Headlamp insert is an complete unit. Consist of glass lens and mounted light reflector. The delivery included the bulb socket for the parking lamp. 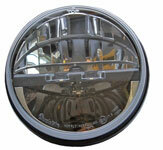 Bilux - Headlamp insert is an complete unit with light reflector. Leaver for the headlights for the mechanical beam adjusting. Fit to Trabant 601 with R2 or H4 headlamp inserts and Trabant 1,1. Head-lamp-housing without mechanical beam adjusting.